Prisoner of War during WWII. BARDON, Louis (Lou)-At St. Mary's Hospital, on Tuesday, June 4, 1991. Louis (Lou) William Barton, age 67 years, of 660 Weber St. E. Kitchener. Mr. Bardon co-owned and operated K-W Vending and latterly worked for V.S. Services until his retirement. A member of the Royal Canadian Legion, Branch 530, Waterloo, a paratrooper in the First Special Service Force in the Second World War and a prisoner of war. Beloved husband of Helen (nee Harper); dear father of Michael and his wife Brenda of Kingston, Patrick and his wife Judy of Mississauga, Heather Euler and her husband Dieter of Waterloo. Loving grandfather of Christine, Elizabeth, Christopher and Trevor. Brother of Fred and his wife Joan, Nancy and her husband Louis Koppeser, all of Kitchener. Predeceased by his parents and son, Stephen. Greatly missed by Max. Friends and relatives may call at the Ratz-Bechtel Funeral Home, 621 King St. W., Kitchener, where the family will be in attendance this evening (Wednesday) and Thursday evenings, 7-9. Funeral and committal service in the Ratz-Bechtel Chapel, on Friday at 2: 30 p.m. Rev. Marcus Kuehn officiating. Interment Memory Gardens. Memorial donations to the Canadian Cancer Society or the Heart and Stroke Foundation of Ontario, would be appreciated as expressions of sympathy by the family. Reception to follow in the Ratz-Bechtel Family Centre. 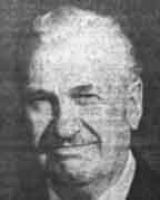 The Royal Canadian Legion, Branch 530, Waterloo, will fold a memorial service at the funeral home Thursday at 7: 30 p.m.
[S74] News - ON, Waterloo, Kitchener - Kitchener-Waterloo Record (1948-1994), Obituary of Louis William (Lou) Bardon - Jun 5 1991. [S2173] Find A Grave, Louis William "Lou" Bardon (1924 - 1991) - Find A Grave Memorial. (2017). Findagrave.com. Retrieved 26 April 2017, from https://www.findagrave.com/cgi-bin/fg.cgi?page=gr&GRid=121375858.